A winter storm dumped another coating of snow on the tri-state Sunday evening and brought with it a shot of bitter cold that will keep the powder from melting through the first part of the week. Snow arrived in the late afternoon west of New York City and moved through the area by early Monday. Most parts of the tri-state saw between 1 and 2 1/2 inches of snow, with New York City seeing totals in that range. 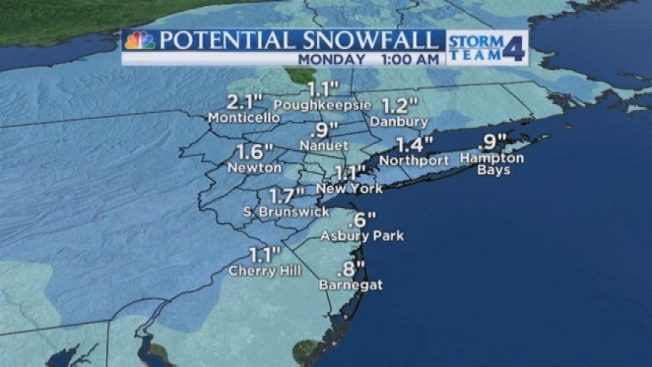 The New York City Office of Emergency Management issued a travel advisory for Monday. The city's transportation department also suspended alternate-side parking rules while crews work on snow removal. Meter rules will remain in effect. As the snow passes, the region is set to stay locked in a deep freeze, with temperatures not climbing above 32 degrees until Wednesday. Another winter storm is expected to hit the area Thursday, forecasters say.